RiskFive is a name of both a hardware board and a software project. The board is using the Field Programmable Gate Array (FPGA) technology for maximum flexibility. RiskFive is targeting deeply embedded applications where both the hardware interface and the processing algorithm are defined after the deployment. The hardware pins of the FPGA can be configured in field (input, output, or in-out). The FPGA configuration can be loaded anytime, turning the FPGA into a simple microcontroller, a multicore microprocessor, or an functional equivalent of the Application Specific Integrated Circuit (ASIC). This approach allows to address many diverse applications using the same hardware. This initial Development Edition of RiskFive is composed of two boards. The FPGA System On Module (SOM) is shown below. The Development Motherboard is shown in a separate page. The Development Motherboard will provide the environment for the SOM. Future motherboards will provide application specific functions, turning the SOM into a versatile data acquisition, an industrial controller, or an FPGA exploration system for electrical engineering curriculum. Our own primary interest is in Data Acquisition (DAQ) for nuclear physics, but RiskFive can target many other scientific and industrial applications. 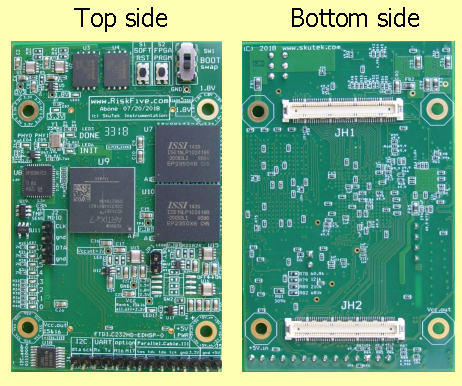 The PDF schematics of both the SOM and the development board are released on the schematics page. Both the SOM and the motherboard were sent to production in August, 2018. Waiting for the boards, we implemented firmware and Ethernet software using Digilent Arty-7 and Arduino "wing" with Wiznet W5500. The firmware and software will be moved to RiskFive when it arrives. Both the SOM and the motherboard have been received from manufacturing in early October, 2018. We successfully applied power to one of the assemblies. The photograph is shown in the News page. We will now start moving both firmware and software from Arty to RiskFive. We gratefully acknowledge the support by the Department of Energy (DOE) Office of Science, Nuclear Physics, under the DOE SBIR grants DE-SC0009543 and DE-SC0013144.